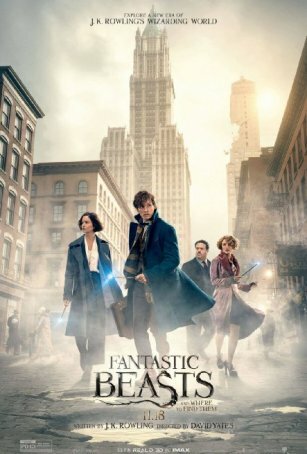 As a stand-alone spin-off that takes us back to the enchanted world of Harry Potter, Fantastic Beasts and Where to Find Them provides an engaging two hours. As the beginning of a new fantasy/adventure series intended to span several chapters, its success is less certain. The best parts of Fantastic Beasts are those that deal with the immediate storyline. Those that seek to extend the narrative are less interesting. It’s easy to be cynical about the existence of this new series (which, according to the most recent reports, is intended to span five movies). The box office bonanza provided to Warner Brothers by the eight Harry Potter movies was so enormous that it seemed unlikely the studio would rest with Harry Potter and the Deathly Hallows Part 2. All that remained was getting J.K. Rowling on board and, once she had agreed not only to outline the story but to pen the screenplay, it was full speed ahead. So, although there’s no doubt that profitability was the primary goal for making the movie, at least the filmmakers have produced something entertaining in the process. Fantastic Beasts is sufficiently detached from the Harry Potter books/movies so that a prospective viewer doesn’t require familiarity with the latter to enjoy the former. But there are enough hooks, links, and call-backs to reassure Harry Potter fans that we’re still in the same universe, although the continent and era have changed. Instead of this story transpiring in the U.K. circa 2000, it’s in the mid-1920s New York City. The movie focuses on British wizard Newt Scamander (Eddie Redmayne), who begins his American odyssey by disembarking at Ellis Island. He carries with him a battered brown briefcase that’s more than a simple repository of personal items. Instead, it’s a portal into another dimension where his collection of “fantastic beasts” resides. When several of his creatures escape as a result of an unfortunate accident, he institutes a city-wide hunt. Along the way, he co-opts the help of a “No-Mag” (a.k.a. “Muggle”) named Jacob Kowalski (Dan Fogler), who owns a briefcase almost identical to Newt’s. The foreign wizard’s activities are watched by Tina Goldstein (Katherine Waterston), an agent for the Magical Congress of the United States of America, who decides to bring Newt in for the unlawful importation of magical creatures. Percival Graves (Colin Farrell), the Director of Magical Security, takes an interest in Newt’s case because his arrival occurs just as the carefully concealed existence of wizardry is threatened with national exposure. The scenes in which Newt and company track down the beasts are among the film’s most enjoyable. The magical menagerie includes a giant creature in heat looking for a mate, a possum-like animal with an appetite for gold and gems, a winged snake that “expands to fill all the space”, and an invisible entity that proves frustratingly elusive. The hunt takes our intrepid heroes all around New York City, including stops at Macy’s Department Store and the Central Park Zoo. They also visit the subway and spend time under lock and key at the Magical Congress’ headquarters. The “bigger picture” appears to be setting up a struggle between the forces of good, led by Newt, and the forces of evil, fronted by the Dark Wizard Gellert Grindelwald (Johnny Depp). We don’t see enough of Grindelwald (who previously appeared in Harry Potter and the Deathly Hallows Part 1) to make any final determinations about him but one hopes he doesn’t turn out to be a Voldemort knock-off with Captain Jack mannerisms. This aspect of Fantastic Beasts is decidedly generic and, unless Rowling takes it in an unexpected direction, it doesn’t bode well for the overall arc. The Harry Potter movies, like their written inspirations, possessed a charm that crossed generational barriers. Although they became more serious as the series progressed, they transported the viewer to an alternate universe where magic and mundanity co-existed in (relatively) peaceful harmony. Fantastic Beasts feels a little different featuring more of a traditional fantasy tapestry. Director David Yates, who helmed the final four Harry Potter installments, brings a strong sense of continuity but Fantastic Beasts isn’t as whimsical or wondrous (except, perhaps, when the characters venture into Newt’s TARDIS-like briefcase - yes, it’s bigger on the inside than on the outside). Its representation of pre-Depression era New York City is, however, richly detailed and effectively realized from the set design to the costumes. This may not be a perfect recreation of mid-1920s Manhattan but it meets expectations built from still photographs and contemporary motion pictures. The cast blends British and American actors. It’s strange to realize that Oscar-winner Eddie Redmayne never made it into the Harry Potter movies; he’s a perfect fit. His borderline-autistic portrayal of Newt is only briefly off-putting; he quickly becomes likeable. Katherine Waterston is an effective foil/quasi-love interest for Newt. (What a difference from Inherent Vice!) Their chemistry is immediately apparent and it will be interesting to see how the relationship progresses in future installments. Dan Fogler and Alison Sudol fit in nicely as sidekicks. Rowling apparently prefers small groups of heroes to individuals. Colin Farrell, at his sneeringly nastiest, radiates distrust, which is precisely what’s needed for his character. One problem facing Fantastic Beasts is that its audience may be limited from the start. It’s hard to see non-Rowling fans being drawn to the movie. And, although Harry Potter-lovers may appreciate the attention to detail in the building of a semi-familiar world, some will miss their favorite characters. Newt, Tina, Jacob, and Queenie are likeable but it will take more than a single film for them to take their place alongside Harry & co. in the Rowling fantasy pantheon. Fantastic Beasts is an enjoyable stand-alone but its position as the progenitor of a new franchise remains unclear.